Our newest Arts Education Program, D-Tours, is a partnership with the San Diego Unified School District bringing LGBT-themed shows to high school campuses across San Diego County. In this traveling program, Diversionary will connect with schools and students unable to participate in our Student Matinee series or other programming we offer. D-Tours provides an important opportunity to meet the students where they live and work with a powerful performance exploring LGBT themes and issues, providing exposure to the theater arts for youth from a broad spectrum of socioeconomic backgrounds. D-Tours will reach over 2,000 students annually in the San Diego Unified School District and is provided FREE of charge to schools. The first D-Tours production is the award-winning solo show Queer Heartache, written and performed by Trans New York City-based spoken word artist Kit Yan. Queer Heartache is a tour de force autobiographical exploration what it means to be Trans, Queer, and an Asian-American immigrant. Kit has toured the show across the country to great acclaim, appearing at American Repertory Theater in Boston, IRT Theater and The Brick Theater Transgender Theater Festival in New York City, San Francisco Fringe, and Chicago Fringe. They presented the show on Diversionary’s Mainstage in Fall 2018. Queer Heartache is the recipient of the Spirit of Fringe, Artists’ Pick, and Audience Choice Awards at the 2015 Chicago Fringe Festival, as well as the Best of Fringe and Volunteer’s Choice Awards at the 2016 San Francisco Fringe Festival. Considering the timeliness of the issues facing queer, Trans, and immigrant communities, Queer Heartache will have a significant impact on the young people it reaches and provide a powerful launch of this new touring program throughout San Diego County. For more information or to book a performance please contact Skyler Sullivan, Education Associate at ssullivan@diversionary.org. Queer Heartache is an explosion of slam poetry that is at once compelling, hilarious, and, as its title promises, heart breaking. 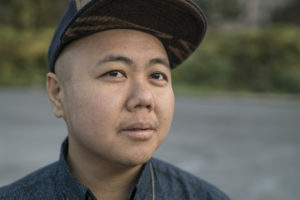 Award-winning poet/performer Kit Yan takes the audience on an adventure ride through their life, investigating what it means to be Trans, Queer, and Asian American. Navigating the intimate and formidable landscape of family, the dating pool, and the medical establishment, Kit will steal your heart and change how you look at the world around you. Hold tight to your rainbow and enjoy the ride! Kit is a 2018-19 Dramatists Guild Foundation Fellow, 2019 Lincoln Center Writer in residence, and a 2019-2020 Musical Theater Factory Makers Fellow. Their musical written with Melissa Li, Interstate, won 5 awards at the 2018 New York Musical Festival, including Best Lyrics. Kit’s show Queer Heartache has won 5 awards at the Chicago and SF Fringe Festivals, and their second musical written with Melissa Li, Miss Step, is under first draft commission at 5th Avenue Theater. Learn more about our free programs for kids, teens, and older adults!